A joint NSW Police and Roads and Maritime Services (RMS) compliance operation targeting truck-and-dog combinations has nabbed a number of vehicles and a driver for breaches. 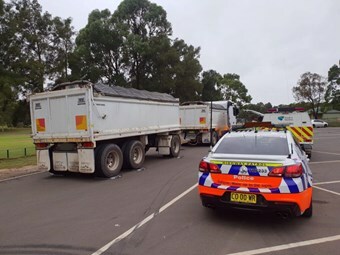 On February 1, the Traffic Task Force and RMS heavy vehicle inspectors conducted heavy vehicle compliance inspections within the Penrith area, NSW Police reports. Despite only 10 combinations inspected, three had substantial weight breaches and one combination had a minor weight breach. Three major defect notices were issued for problems such as air leaks, seatbelts, lighting and a further four heavy vehicles were issued for minor defects related to miscellaneous issues. An interstate heavy vehicle licence holder was also charged for driving with revoked NSW privileges and will face court at a later date. "Whilst the ‘truck and dog’ space is providing critical support for projects, the task has to be done safely on our roads," NSW police stakeholder relations manager NSW Phillip Brooks comments..